Most of us have small bathrooms. Because the biggest challenge of the bathroom is that a lot of people need to share it and it's a small space, keeping it all organized and neat goes a long way toward keeping it clean. By design, most bathrooms leave little room for major improvement in terms of storage. Still, there are plenty of little things you can do to make the most of these cramped quarters. These small bathroom ideas for organizing and storage can help get you started making the most of this small space. 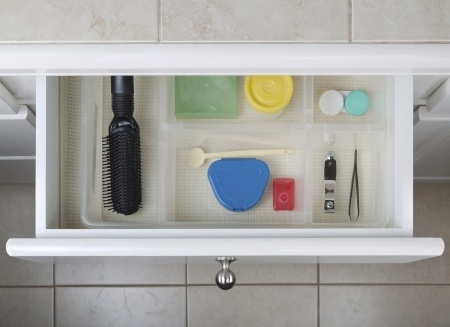 Start the process by cleaning out the one major area in the bathroom that was designed specifically for toiletry storage - the medicine cabinet. Get rid of expired medications as well as any toiletries you've had for longer than two years, including shampoos, lotions and makeup, and soap. Besides creating more space, clearing out your cabinet will minimize health risks, as bacteria and fungi can contaminate lotions and cosmetics over time. Or you can hang a shower caddy over the shower head to keep shampoo, shaving cream, soap, and razors within easy reach but somewhat out of eyesight. Another space-maximizing device is a system of coated-wire rollout baskets, which can be used to expand the storage capacity of under-the-sink cabinet space. If your bathroom has no storage space there, mount a small coated-wire grid on the wall and hang personal appliances such as hair dryers and curling irons from it with S-hooks. Small bathroom ideas for organizing your toiletries: Take advantage of the empty space above the toilet by adding a small cabinet or shelves to hold extra linens or toiletries. You can also place your deodorant, perfume, hair dryer, and hairbrushes in the clear plastic pockets of a back-of-the-door shoe holder; this will keep these frequently used items from taking up counter space but within easy reach. A second shower curtain rod, added behind and level with the first, provides a handy place to hang wet towels so they can air-dry before you fold and return them to the rack. Since running out of toilet paper is something you'd like to avoid, store at least one spare roll in the bathroom rather than in the linen closet. Hide the extra roll in a simple covered basket with the lid slightly ajar. It remains discreetly hidden, yet you, your family, or a guest can grab it in a moment of need. Use a wicker or wrought-iron wine rack to store rolled washcloths and towels. This not only a way to put extra storage and spare towels at the ready, but rolled towels can also provide a colorful accent, especially in a child's bathroom. Add over- and above-toilet shelving. Put wooden shelves along one wall or buy an over-the-commode unit with shelves. Here you can place those little knickknacks you can't live without and a small clock to keep you and the kids on schedule in the morning. Add near-sink shelving. If you're really short on space, single shelves hung near the sink provide perfect resting spots for soap, toothbrushes, and other daily essentials. Add towel bars with built-in shelving over the top. You can hang used towels on the bar and stack fresh replacements on the shelves for easy use. Bring in wicker storage units. These are a good choice for baths because they withstand humidity well. And most pieces come with drawers for more bathroom-stuff storage for you and the kids. These small bathroom ideas are a starting place - customize them as needed to make your bath an organized, functional place for you and the family.